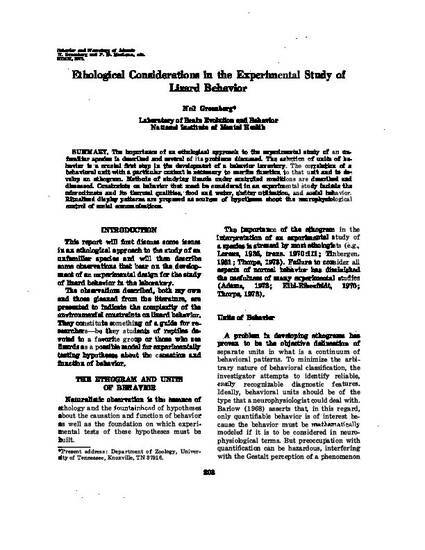 The importance of an ethological approach to the experimental study of an unfamiliar species is described and several of its problems discussed. The selection of units of behavior is a crucial first step in the development of a behavior inventory. The correlation of a behavioral unit with a particular context is necessary to ascribe function to that to that unit and to develop an ethogram. Methods of studying lizards under controlled conditions are described and discussed. Constraints on behavior that must be considered in an experimental study include the microclimate and its thermal qualities, food and water, shelter utilization, and social behavior. Ritualized display patterns are proposed as sources of hypotheses about the neurophysiological control of social communications.